Join A Wider Bridge supporters and communities in New York City, Washington DC, and South Florida, to meet our newest grantee, the Israel LGBTQ Refugee Program. August 15-24! LGBTQ asylum seekers and refugees in Israel and across the Middle East face a myriad of challenges in search of a better life, including exposure to intense homophobia and transphobia, domestic violence and abuse, loneliness, national language barriers, and uncertain legal statuses. 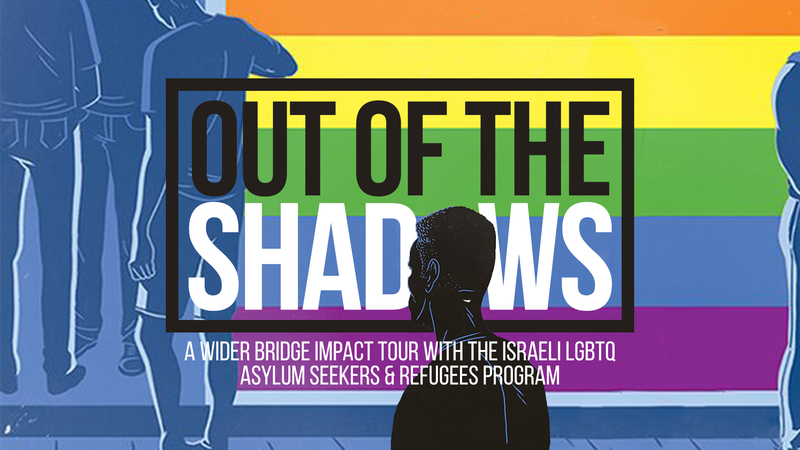 Meet Eyal Migdalovich, founder of the LGBTQ Refugee Program, and Ohad Hizki, CEO of the Aguda, (the initiative’s sponsoring organization), to discuss their groundbreaking work assisting these marginalized populations. Eyal and Ohad will share their ongoing outreach and trust-building with Arab and African refugees and asylum seekers, within Israel and beyond. The Israeli LGBTQ Refugee Program, an AWB Impact grant recipient, provides LGBTQ Arabs, Palestinians, Africans, and other marginalized minority groups with legal, psychological and financial services, and access to health care, housing and employment. Thanks to the LGBTQ Refugees Program and the AWB Impact grant provided by A Wider Bridge, more of these individuals today have the resources to lead more certain lives — out of the shadows. Foundry UMC, 1500 16th St NW.